The former Democratic Sen. George McGovern, who lost the 1972 presidential election to Richard Nixon and gained fame throughout his career for his devotion to fighting hunger and opposing war. The family of ex-U.S. Sen. George McGovern says the 90-year-old is "no longer responsive" in hospice care. His daughter Ann McGovern told The Associated Press that her father is "nearing the end" and appears restful and peaceful. She says it's a blessing that she and other family members are able to be with him. McGovern was the Democratic presidential candidate who lost to President Richard Nixon in 1972 in a historic landslide, winning only 37.5 percent of the popular vote and carrying only Massachusetts and the District of Columbia in one of the worst defeats in U.S. history. Despite the devastating loss, McGovern’s legacy as one of the most liberal candidates of the last half century looms large among politicians of the Baby Boom generation. While campaigning in 2008, Hillary Clinton boasted of her work registering Latinos to vote in Texas for McGovern, according to the Huffington Post; she moved there in 1972 with her husband Bill Clinton, who was tasked with organizing the state. McGovern's grassroots campaign was immortalized, too, for its central role in Hunter S. Thompson’s series of articles compiled in "Fear and Loathing: On the Campaign Trail ’72." It was also chronicled by Timothy Crouse in “The Boys on the Bus,” considered one of the first insider looks at campaigning. George Stanley McGovern was born in 1922 in Avon, South Dakota, a farming town of 600. His father was a pastor who had once dabbled as a minor league baseball player. His mother, a Canadian, had moved to South Dakota looking for secretarial work. In high school, he excelled at debate, an extracurricular that in 1939 pitted him against twins Ila and Eleanor Stegeberg. The twins won, but in the long run so did McGovern – he courted Eleanor through college and married her in 1943. Stegeberg died in 2007. 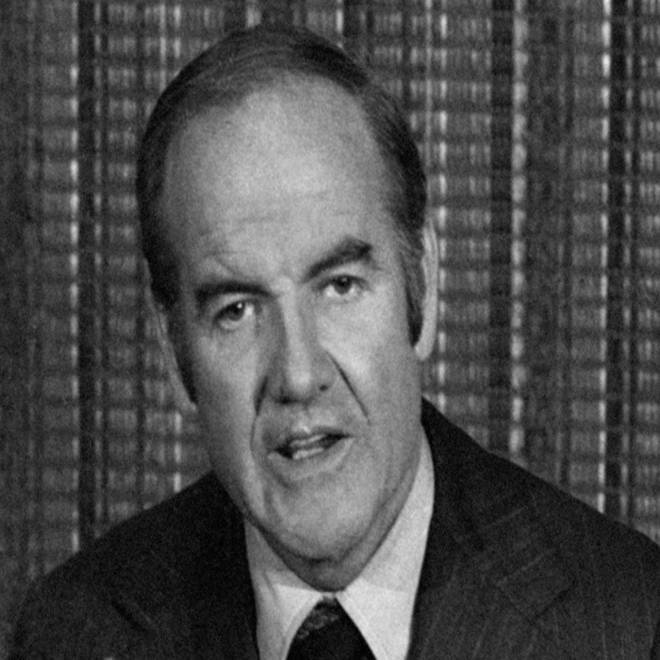 In college, McGovern won the state’s oratorical contest for his speech, “My Brother’s Keeper,” about one’s responsibility to mankind, according to his personal biography. His education was interrupted by World War II, during which he flew 35 combat missions as a B-24 bomber pilot in Europe -- earning him the Distinguished Flying Cross. He eventually earned a Ph. D in American history and government and was one of two senators with a Ph. D when he launched his 1972 presidential campaign, according to the Times article. He was a member of the U.S. House from 1957 to 1961, a U.S. senator for South Dakota from 1963 to 1981 and leader of his party’s liberal wing during that time. He was vehemently opposed to the Vietnam War -- the crux of his platform against Nixon. “The great presidents, in my judgment, weren’t men with the killer instinct. The three biggest presidential monuments in the capital are dedicated to Washington, Jefferson and Lincoln. These were very tough-minded men, but it wasn’t the killer instinct that guided them. "I think these were men with a rare degree of prudence, wisdom and compassion – qualities that are much needed now. Some cynics feel that decency in a politician is a handicap. A historian and prolific author, McGovern had been hospitalized several times in the past year after complaining of fatigue and dizziness. He tripped and fell outside the McGovern Library in December, before he was supposed to appear on C-Span for a series about candidates who weren’t elected, according to Tom Lawrence, assistant editor of The Daily Republic in Mitchell, S.D., who watched as the former senator was wrapped in a quilt, waiting for an ambulance. In recent years, McGovern focused on world hunger. On Wednesday, McGovern's family encouraged people to donate to Feeding South Dakota in honor of the senator.